The news of the untimely death of Tom Dunford at St Vincentâs University Hospital, Elm Park, on the 8th November 2009 following a short illness, borne with great dignity, courage and humour, was greeted with a sense of extreme loss and sadness by those privileged to know him. Tom, who was only fifty years of age, was a son of Stephen and Bernie Dunford of Castlebar Co Mayo and was the third eldest of a family of five, four boys and one girl. Having completed his primary education, Tom received his secondary education at St Gerardâs Secondary school. He went on to study computer programming in the RTC in Galway. He subsequently obtained employment with the Ulster Bank, in Glenamaddy where he worked for six years. He then became a long distance truck driver and had a number of other occupations before entering the Civil Service where he was employed in the Revenue Department, until the time of his death. His brother John in an eulogy at the funeral Mass said in reference to Tomâs many employments, that it was ironic that he should end up in the Civil Service where his mother had wished him to be in the first place. Tom married Eithne Dunne of Killucan Co Westmeath in 1985 and since April 1986 they have lived happily in their home in Clonard Park, Dundrum. Their marriage was blessed with two sons Josh and Luke now aged twenty three and nineteen years respectively. Tom was a very jovial and light hearted character with a pleasant and easy manner who had a great love of music as well as the outdoor life. He was very well known. He was a valued and much loved member of Naomh Olaf GAA Club and served as a team mentor for a number of years. He was fond of hiking and hill walking and was almost invariably accompanied by some member or members of his family. He had a passion for blues music. 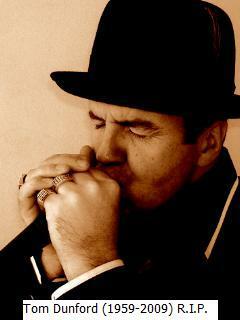 In his early years he played the thin whistle and the piano but later took up the harmonica. He was also a lovely singer. He took great pleasure playing and singing with his own blues band âLightnin T and the Thunder Boltsâ and he sometimes played and sang with other groups. Tom was a man of sound Christian values who displayed love and affection towards his wife and family. His parting has left heart felt pain that will only ease with the passage of time. He will be remembered with fondness and respect by all who knew him. It is well to remember that those we hold dear never truly leave us, they will live on in the kindness they showed, the comfort they shared and the love they brought into our lives. Tomâs remains were reposing at Peter Masseyâs Funeral Home, Balally on Monday the 9th November 09 until 12:30 pm on Tuesday the 10th November 09. The removal took place from his home in Clonard Park, to the Church of the Ascension of our Lord, Balally at 4:45pm on same date, arriving at the church at 5pm. Members of Naomh Olaf GAA Club formed a Guard of Honour as the coffin draped in the Naomh Olaf GAA Club flag was received into the church and also as it exited the church the following day. The church was packed to capacity for the removal as well as for the funeral Mass. It was a testimony to the esteem in which Tom was rightly held. The celebrant of the Mass was Tomâs brother-in-law Father Vincent Dunne of Saint Patrickâs Missionary Society Kiltegan, ministering in Nairobi. Among the gifts offered during the offertory procession was a pair of Naomh Olaf Club shorts, a Mayo County jersey, a pair of shoes representing his band uniform, a harmonica and a hiking stick. The burial later took place in Kilmashogue cemetery. In a fitting tribute to Tomâs love of music the renowned musician Sharon Shannon played a couple of tunes at the graveside and she was ably accompanied by Richie Buckley. Following the burial the family invited their friends, many of whom had travelled long distances to a reception in Naomh Olaf GAA Club.